Family day along the Canal: I well remember the days when the Ma’ and Da’ used to bring all us Coffey children up along the canal for a walk on Sunday after our dinner. 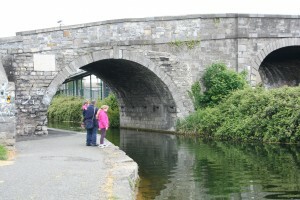 Sometimes we’d head up towards Liffey Junction to see a football match and pick mushrooms in the next field. Other times we’d go in the opposite direction and end up playing in the Tolka River at Cardiffsbridge. The Da’ would just say ‘Strip off there and get in, nobody’s watching…’ He didn’t have to say anymore and in we’d get, both boys and girls. We’d no swimming gear on us at all and not even a towel between us. Us kids were footloose and fancy free without a care in the world. Sure didn’t the Ma’ and Da’ take care of all that for us. I can still see them sitting on the river bank and the Da’ with his shirt sleeves all rolled up and he lighting up a cigarette and the Ma’ fussing over the baby’s bonnet making sure it was pulled down over the little face to stop it getting sunburned. Sure the noise out of us was nobody’s business and we roaring and shouting all over the place. Then we’d hear this strange noise and looking around we’d see the Da’ fast asleep in the grass, snoring with the baby sleeping soundly next to him. And there’d be the Ma’ clicking and clacking with her knitting needles and she running up a new jumper for the Da’ to keep him warm on his bicycle going to work.